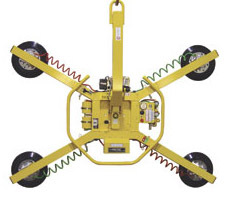 Woods Powr-Grip Manual Rototor/Tilter lifter. 700 LBS capacity, tilts 90 degrees and rotates 360 degrees. Battery Operated. Includes Arm extensions. Available for sale or lease. PLEASE CALL FOR AVAILABILITY.